Things haven't looked this bright for the United States at a U.N. climate change conference since the beginning of the Obama administration. Back in those heady 2009 days, before the disappointment of Copenhagen, Denmark, activists felt sure that eight years of climate stalemate under President George W. Bush had ended, and U.N. diplomats greeted State Department Special Envoy Todd Stern with a standing ovation. The love-fest quickly soured, though, as the administration showed itself unable to shepherd carbon-cutting legislation through Congress and unwilling to commit to a new, internationally binding treaty. Now the tide seems to have turned again. Buoyed by a landmark agreement with China to jointly curb emissions, a $3 billion pledge to an international climate fund and new domestic regulations, observers say that when U.S. officials arrive in Lima, Peru, today for a round of annual negotiations, they will bring credibility to the table. "Other countries will have to sit up and take notice," former Sen. Tim Wirth (D-Colo.), vice president of the U.N. Foundation, said of other nations at the talks. "The U.S. and China agreement is exceedingly important. If the U.S. and China used to hide behind each other's skirts, they're not doing that, and the rest of the world doesn't have anyplace to hide anymore." Paul Bledsoe, a climate and energy fellow at the German Marshall Fund, agreed. "I think the U.S. position is more deeply respected around the world than ever before, because all the major nations are convinced the administration genuinely wants an equitable agreement," he said. "That doesn't mean the U.S. isn't going to take a bunch of positions that people don't like, but there is a genuine sense that the U.S. is truly willing to work with all major nations." The two weeks of talks that begin today are aimed at reaching a new global agreement, to be signed in Paris next year. Still, while the United States may be going into this round with a strong position, it isn't clear how long the global goodwill may last. Simmering just below the surface of the praise that has greeted the U.S.-China deal is a deep skepticism about whether the Obama administration can make good on its half of the deal to cut carbon 26 to 28 percent below 2005 levels by 2025 or deliver on its financial promise to the Green Climate Fund. "When countries commit to something and they fail to deliver, it creates a lot of mistrust," said Gambian Environment Minister Pa Ousman Jarju. Former U.N. Framework Convention on Climate Change Executive Secretary Yvo de Boer said that even though recent developments in the United States have brought goodwill to the Obama administration, leaders still remember that the U.S. efforts under former President Clinton to join the Kyoto Protocol were quickly scuttled by Congress. At that time, it was former Sens. Robert Byrd (D-W.Va.) and Chuck Hagel (R-Neb.) who pushed a resolution that passed unanimously, blocking the United States from participating in any global climate deal in which China did not equally participate. That particular threat may have passed, but de Boer noted that Congress could still throw up new roadblocks. "I'm just hoping it's not going to be Kyoto revisited," he said. "When you have a deal with the U.S. delegation, you don't necessarily have a deal with the United States Senate. That's important to bear in mind." Even as Republican leaders attack the Obama administration, saying the president's proposed carbon regulations are putting America's economic vitality in jeopardy, leaders of the world's most vulnerable countries call the U.S. goal weak. 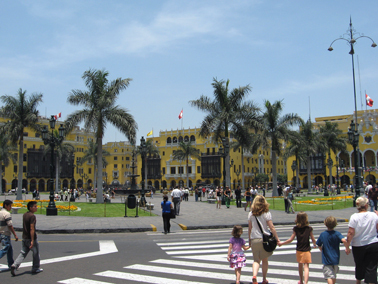 The historic center of Lima, Peru, the stage for a critical climate conference. Photo by Michael Abate. "It is still far behind the European Union," Seychelles Ambassador Ronny Jumeau said of the U.S. target. He noted that when using a 1990 base line -- a year that the United States rejects but that many other countries in the U.N. talks use -- the proposal amounts to a 10 percent emissions cut compared to Europe's proposed 40 percent below 1990 levels. Meanwhile, an Indian news organization this week noted that the U.S. promise actually amounts to a slight reduction of its Copenhagen promise that aimed for a 30 percent reduction below 2005 levels by 2025. Jumeau said the U.S.-China deal has indeed injected a positive spirit into the negotiations, but he said, "We need them to up the ante." Marshall Islands Foreign Minister Tony de Brum said small island states like his that are at risk of extinction from rising sea levels and other climate impacts will have a message in Lima to the United States and other big emitters. "Thank you very much for these wonderful developments, but we are still not there," de Brum said. Of top importance to island nations, he said, is keeping global temperatures from rising more than 2 degrees Celsius above preindustrial levels. That's the point at which scientists say the impacts of climate change will be catastrophic and irreversible, and so far, the targets laid out by a handful of nations don't show that countries are prepared to toe that line. Countries still have until the first quarter of next year to formally unveil the post-2020 targets they will include in the Paris deal. De Brum said vulnerable nations will lean on major emitters to improve their targets, and he believes the United States and China have left themselves "wiggle room" to improve. "We are watching closely to see what the big guys are doing," de Brum said. "We are not yet on track. We are still looking for a way to achieve the 2-degree goal." Activists agreed and said they will spend the next two weeks putting pressure on the United States to boost ambition. "They've helped to create a momentum going into Lima. I think the question is how they will use that in the Lima talks. The answer should be that they will use it to build an agreement that meets the demands of the best science," said Lou Leonard, who leads the World Wildlife Fund's climate change program. He called the U.S.-China agreement a "political game-changer." But, he argued, that's not enough. "There's a difference between the politics and the science, and we need to do both. The question of the U.S. pledge and the low end of that range is not ambitious. The U.S. can definitely do more. Even at the high end of that range, they can do more," Leonard said. Others noted that the United States will likely be hit hard on other issues, like whether the Paris agreement will be internationally binding. That's something Europe and most developing countries want, but the Obama administration, backed by New Zealand and a few others, is pushing for a largely voluntary deal in which some elements are legally mandated, but not the top-level emissions pledges. Still, few argued against the notion that the tenor of the U.N. talks appears to have shifted dramatically, particularly from the U.S. end. During the past months, one diplomat told ClimateWire, State Department officials have been in regular contact with counterparts in key countries -- not only to give a heads-up on big announcements but also to check in and ask what more the United States can be doing or saying to help build a positive environment for a 2015 deal. "I'm as encouraged as I have been in years. Since the pre-Copenhagen days, we have not had this kind of burst of momentum," said Robert Orr, dean of the University of Maryland's School of Public Policy and special adviser to the U.N. secretary-general on climate change. Said Jarju, "We have seen the commitment of the United States under the leadership of President Obama and the Chinese leadership, and we should seize that opportunity. If what they are agreeing to bilaterally is reflected in the negotiations process, I think it would lead to a Paris agreement."